Linux is an open source OS and is widely used in educational sectors, server sectors for being free as well as versatile and easy to use. 1. 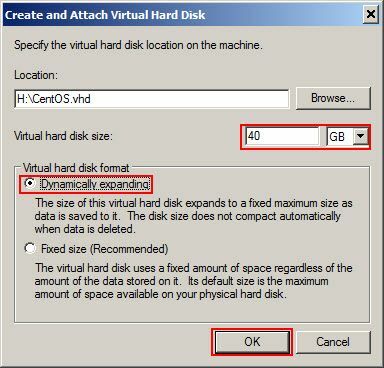 Let's create an virtual harddisk to use for our CentOS installation. 8. 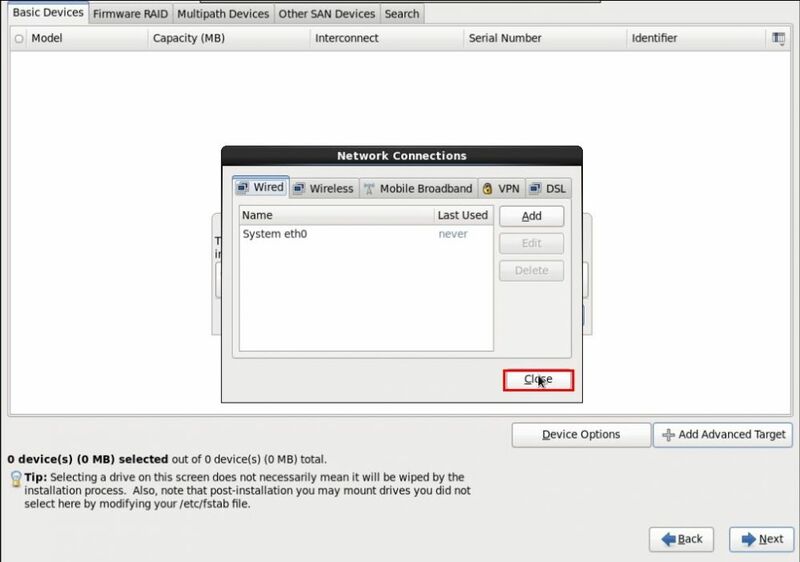 The image will be listed in the CCBoot "Image Manager" (Figure 7). 9. 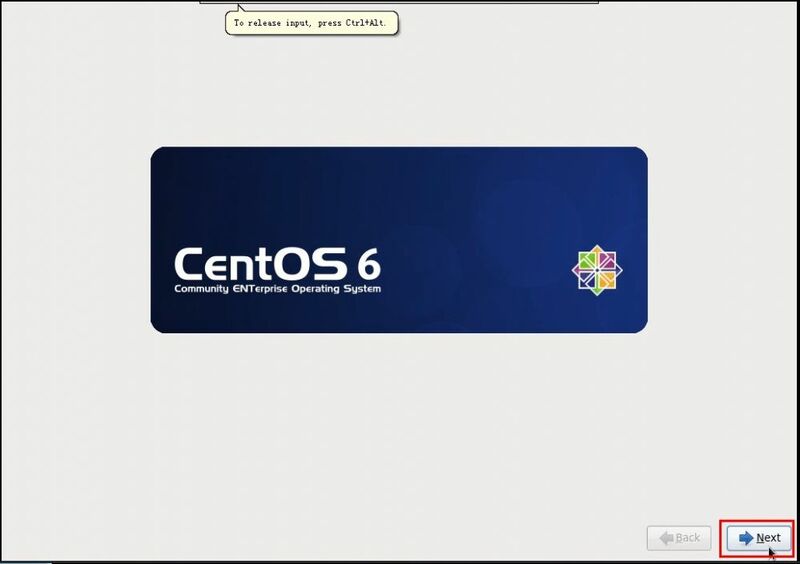 Now, open properties of a client and then assign the "CentOS" image to it, click "OK" to save (Figure 8). 10. Now, right click the same client and click "Enable Superclient" to make it a super client (Figure 9). 11. 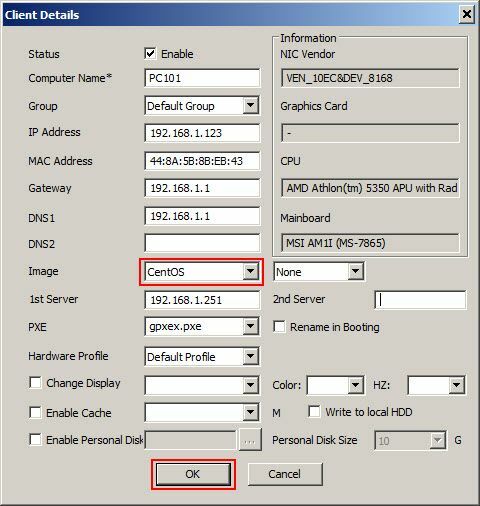 On "CCBoot Select Disk" windows, check the image file and click "OK" button (Figure 10). 13. Now on the client pc, boot from Cent OS DVD or bootable USB drive. If CCBoot Server Setup is completed, prepare the client to install the Linux Operating System. 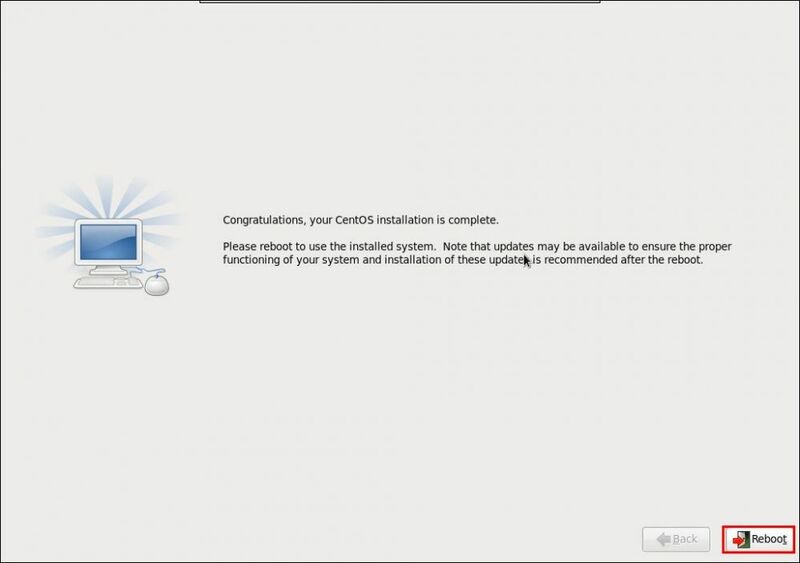 Please use CentOS-6.x-x86_64-bin-DVD1.iso to install. DO NOT use the LiveCD/LiveDVD edition. 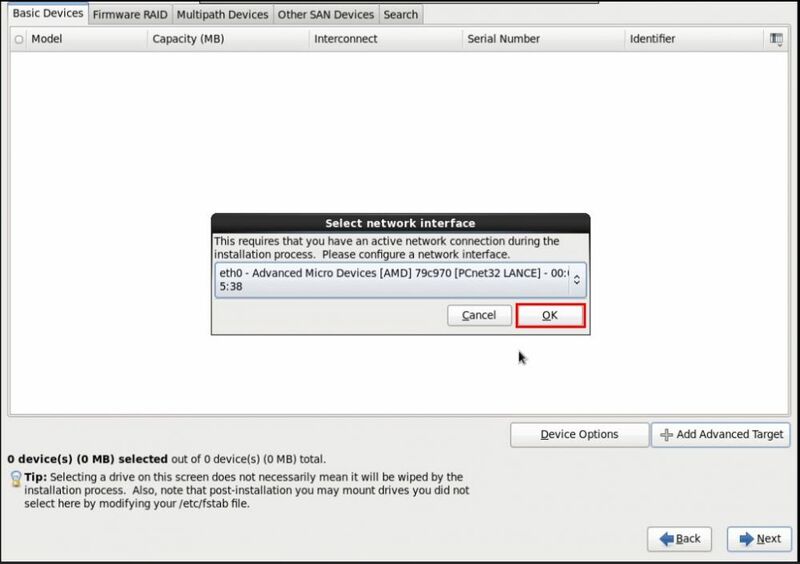 1) Linux installation interface (Figure 12). 2) Select the "Skip" button (Figure 13). 3) Click the "Next" button (Figure 14). 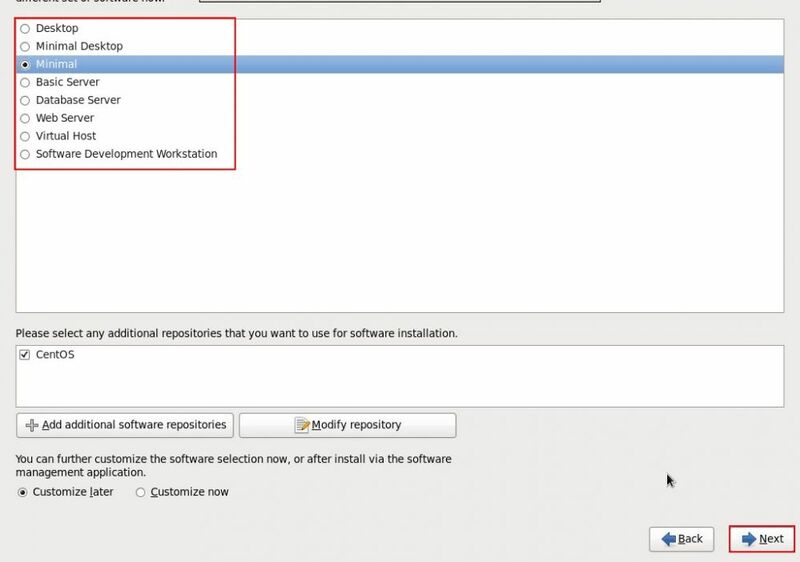 4) Select the installation language and click "Next" (Figure 15). 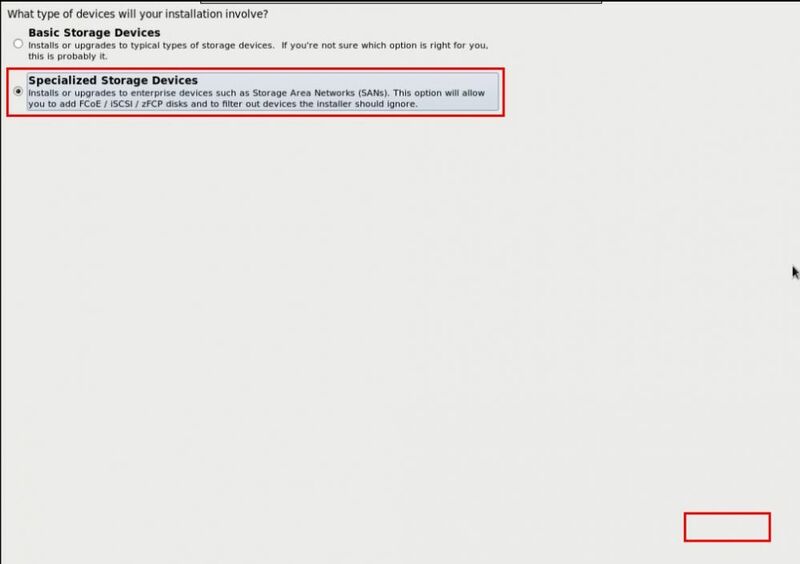 5) Select "specialized storage devices" radio button, and click the "Next" button (Figure 16). 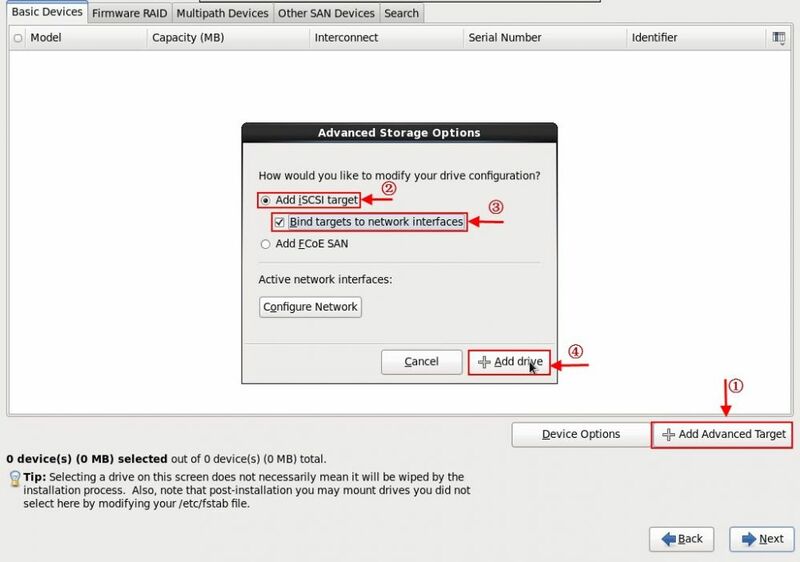 6)Click "Add Advanced Target" button, the dialog box of "Advanced Storage Options" will pop up, and then select the "Add iSCSI target" radio button, and select the "Bind targets to network interfaces" check box, and then click "Add drive" button to go to the next step (Figure 17). 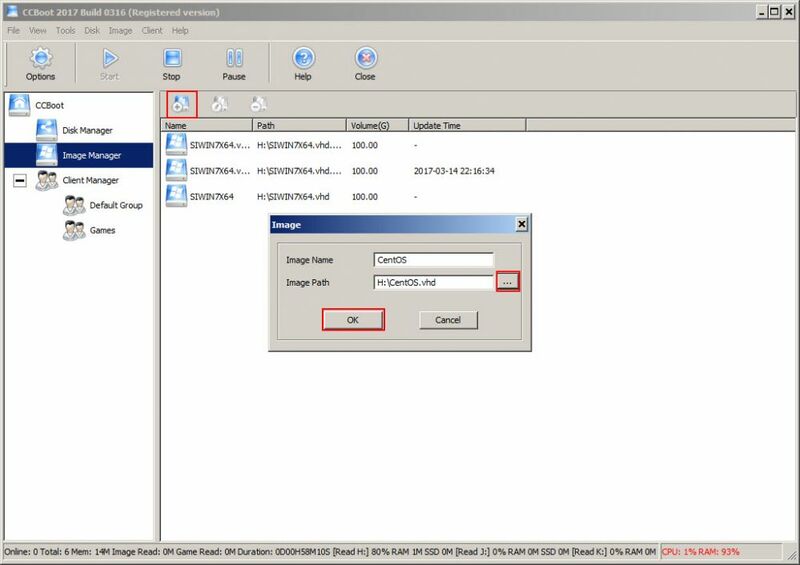 7) In the "Select Netword interface" dialog box, click the "OK" button (Figure 18). 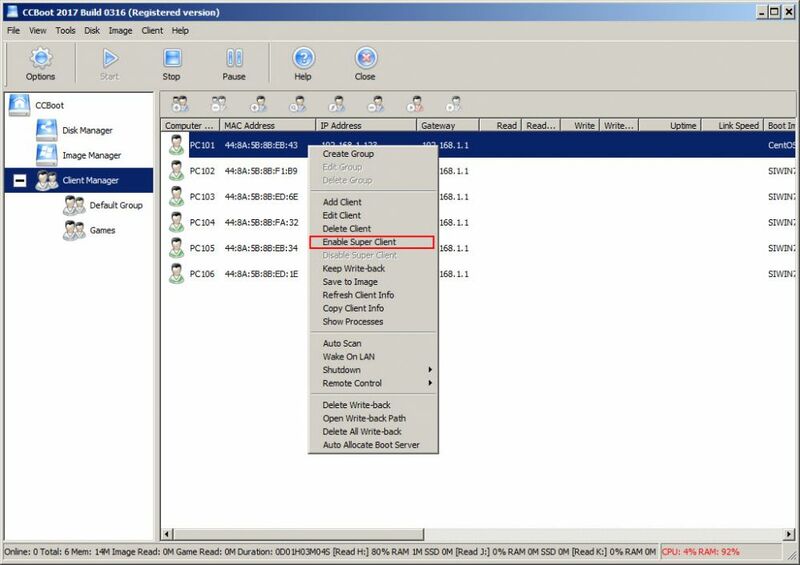 8) In the "Network Connections" dialog box, click the "Close" button (Figure 19). 9) In the "Target IP Address" edit box, enter the server's IP address, and then click the "Start Discovery" button (Figure 20). 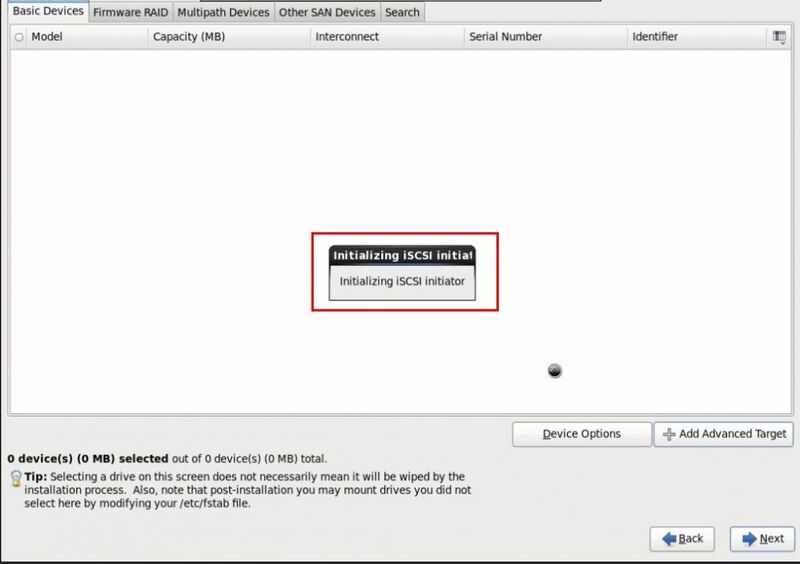 10) "iSCSI disk" initialization process (Figure 21). 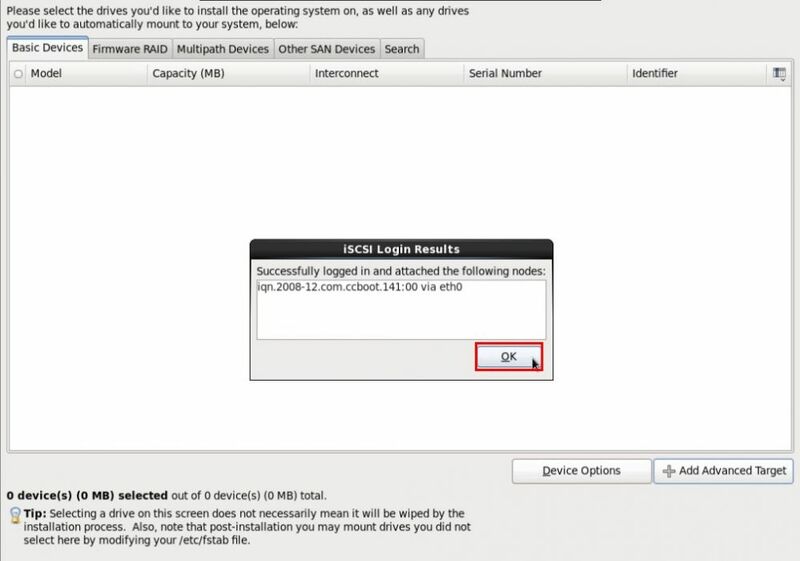 11) After initialization, it will open a pop-up dialog box "iSCSI Discovered Nodes" dialog box, check the box next to the listed iscsi target "iqn.2008-12.com.CCBoot.141:00" check box, and then click the "Login" button (Figure 22). 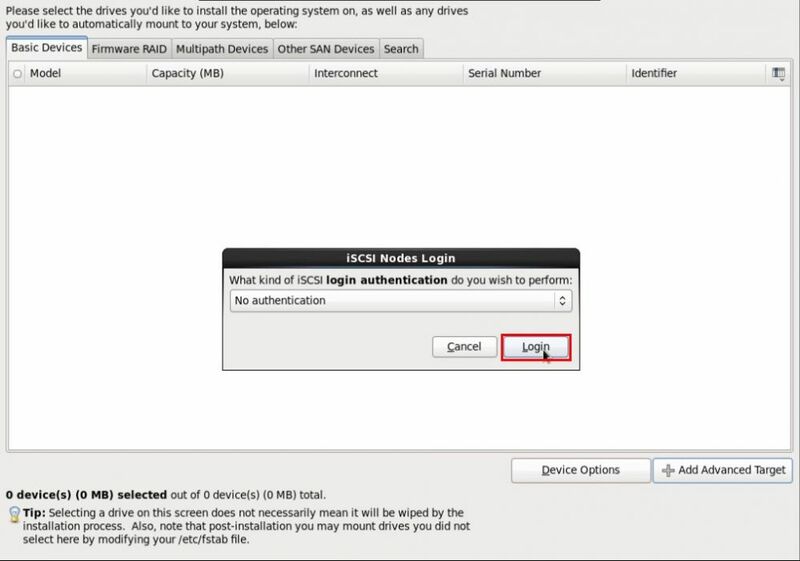 12) In the pop-up "ISCSI Nodes Login" dialog box, click the "Login" button (Figure 23). 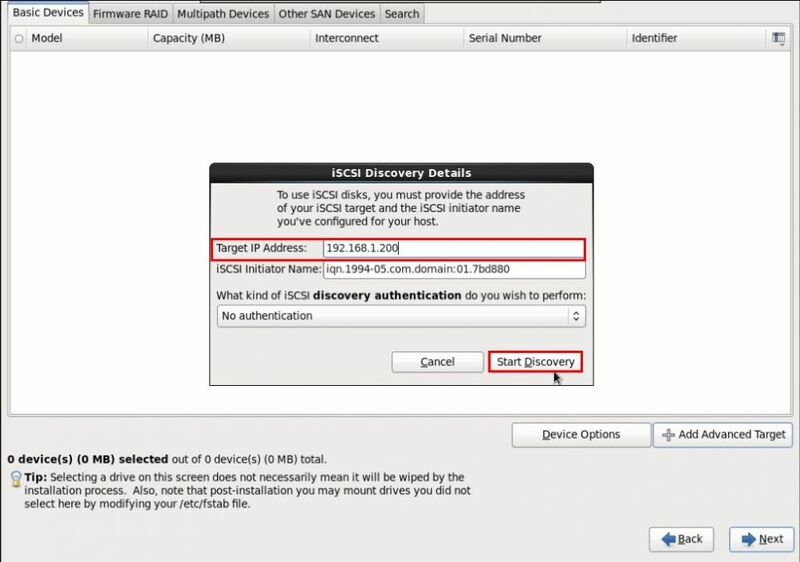 13) In the pop-up "ISCSI Login Results" dialog box, click the "OK" button, and then click the "Next" button (Figure 24). 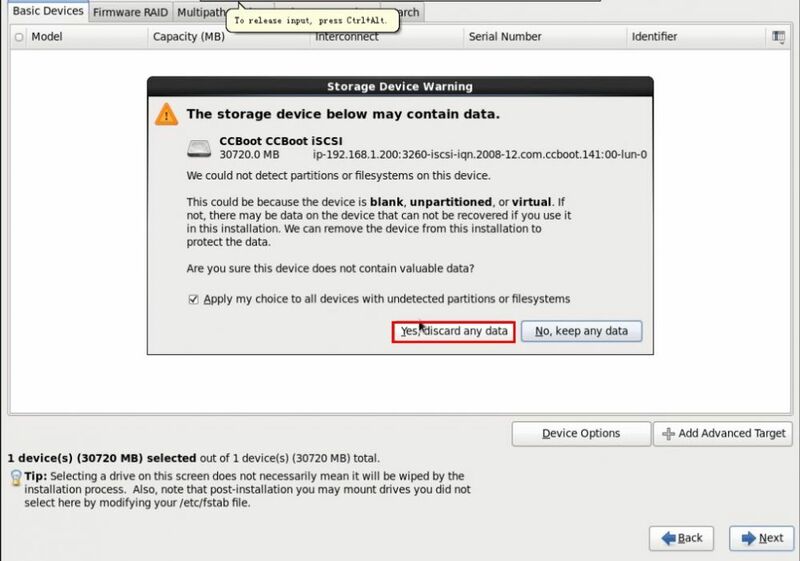 14) In the pop-up "Storage Device Warning" dialog box, click "Yes, discard any data" button, to discarding all data (Figure 25). 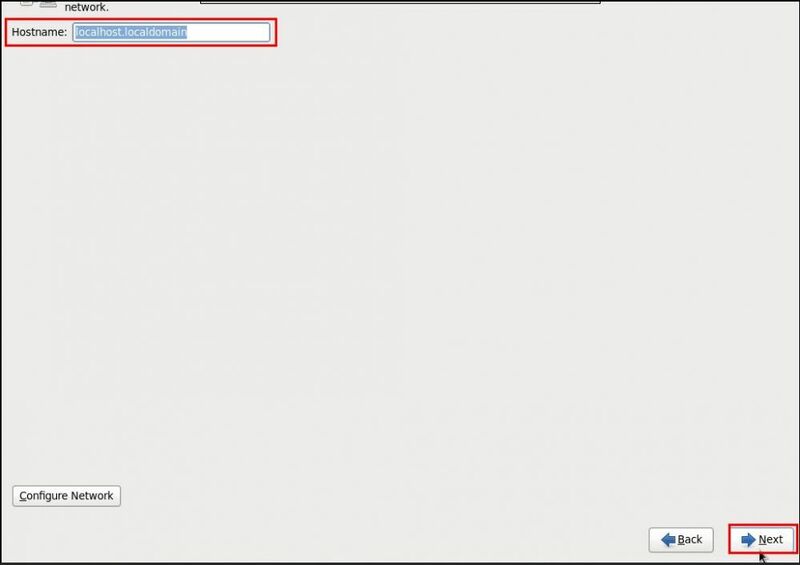 15) After entering your computer name, click the "Next" button (Figure 26). 16) After you select the time zone, click the "Next" button (Figure 27). 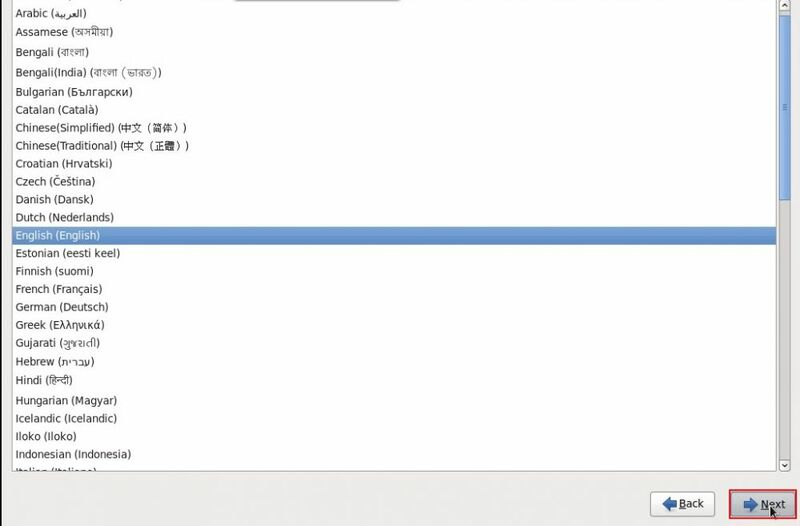 17) Enter the "Root" login password, and then click the "Next" button (Figure 28). 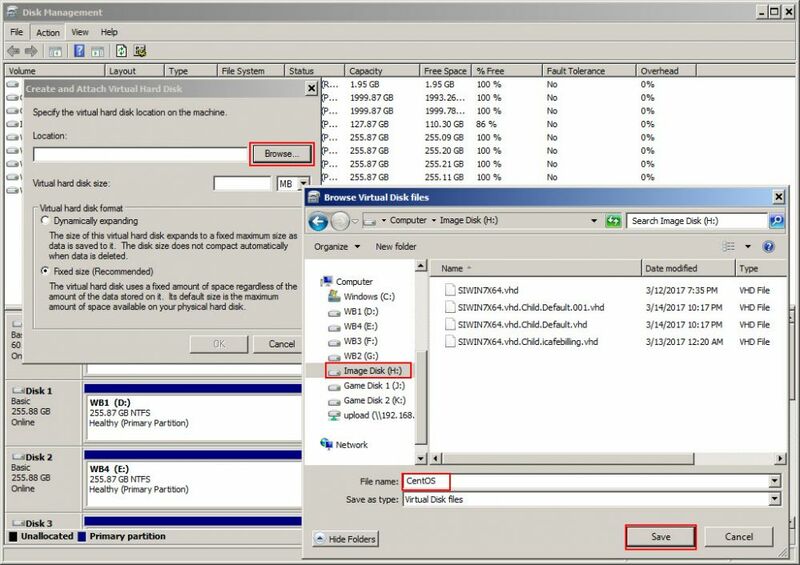 18) Default settings; click the "next" button (Figure 29). 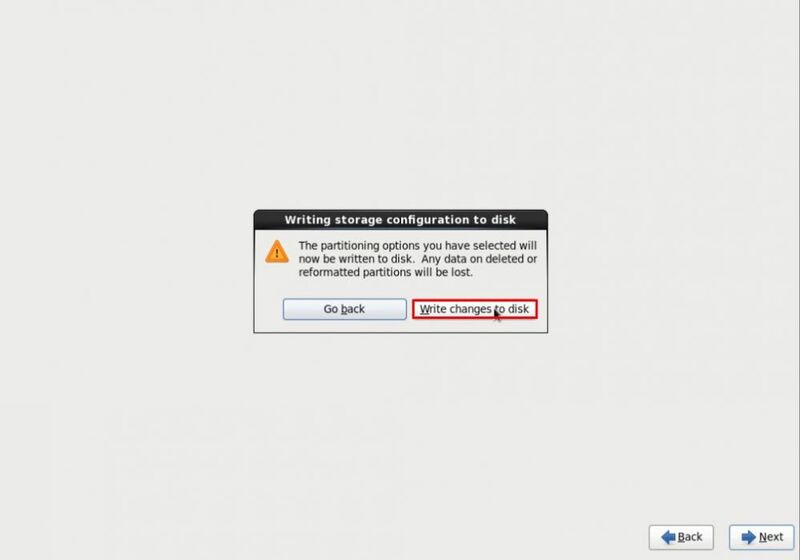 19) In the pop-up "Writing storage configuration to disk" dialog box, click the "Write changes to disk" button (Figure 30). 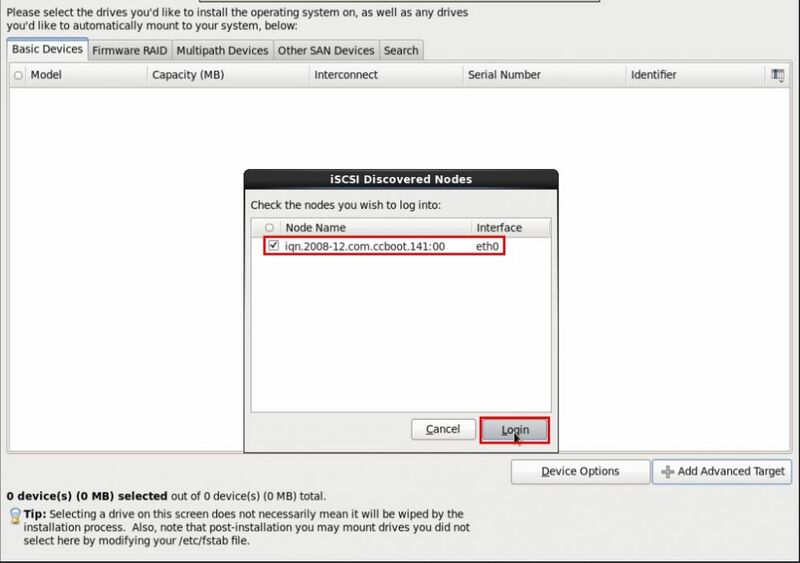 20) Select the version of the installed system ("Minimal" is a command version, the "Desktop" is a desktop version), click the "Next" button (Figure 31). 21) Linux Installation process (Figure 32). 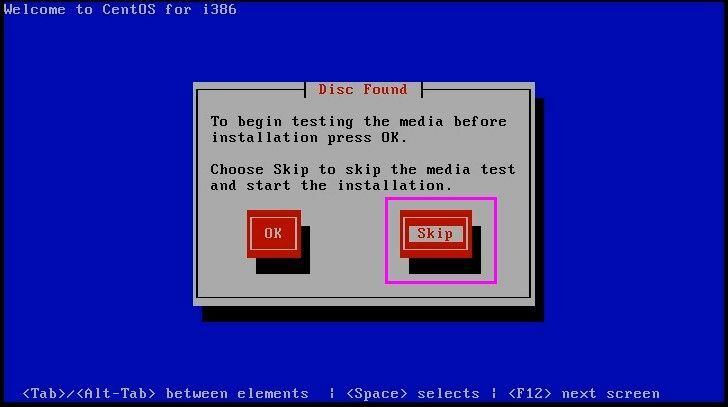 22) After the installation is completed, click the "Reboot" button, to restart the Linux operating system, and now it has no disk (Figure 33). 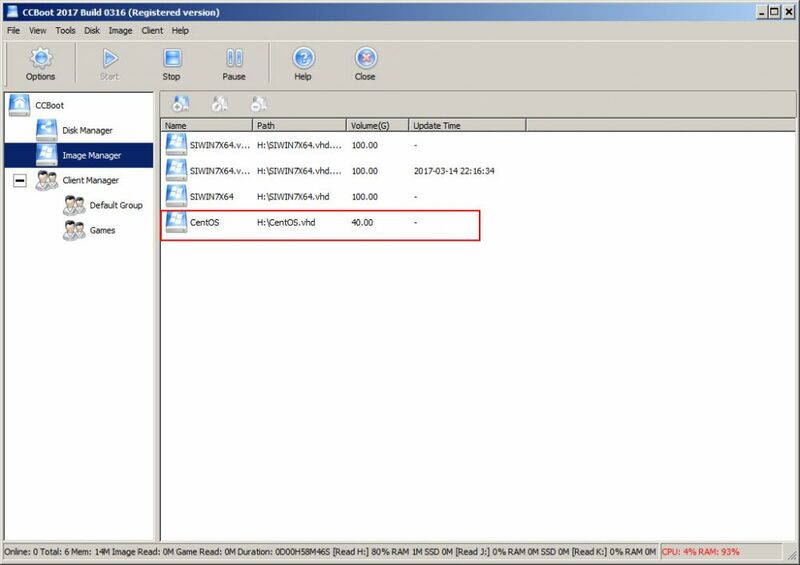 23) Diskless boot one of the client PCs with super client. 24) Run the following commands. 25) Run command as "[root@localhost ~]# nano /etc/udev/rules.d/70-persistent-net.rules" (Figure 34). 26) After modifying (Figure 35). 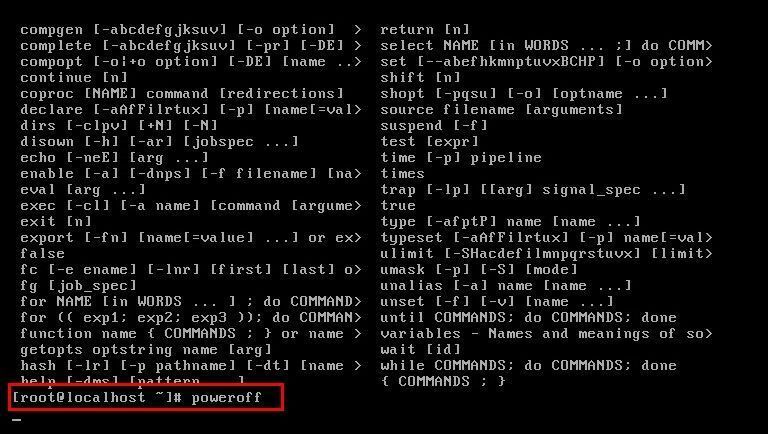 27) Run command as "nano /etc/sysconfig/network-scripts/ifcfg-eth0". Keep these three lines (Figure 36). 28) Run command as "nano /boot/grub/grub.conf" (Figure 37). 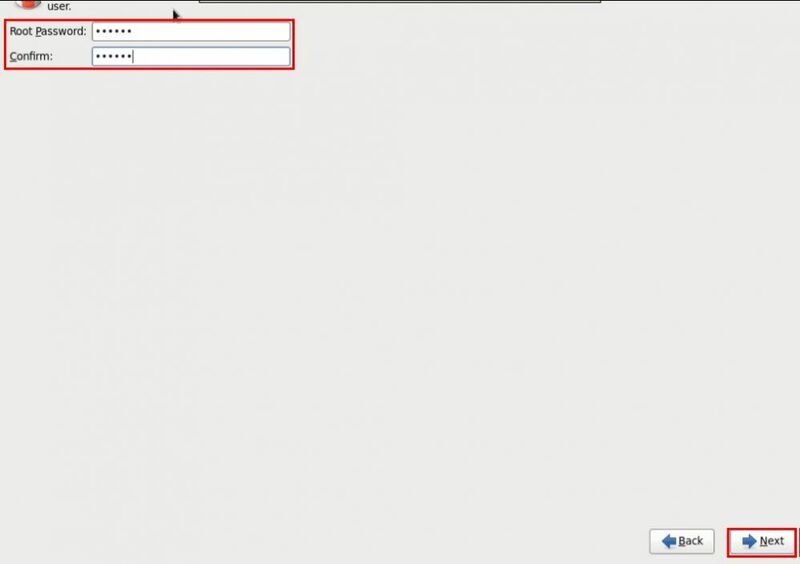 29) After diskless booting Linux Operating System, enter the shutdown command "Poweroff" to safely turn off your computer (Figure 38). 30) After the Linux client security is closed, go back to CCBoot server, and then disable "Super Client" for this PC and save to image directly without creating recovery points. 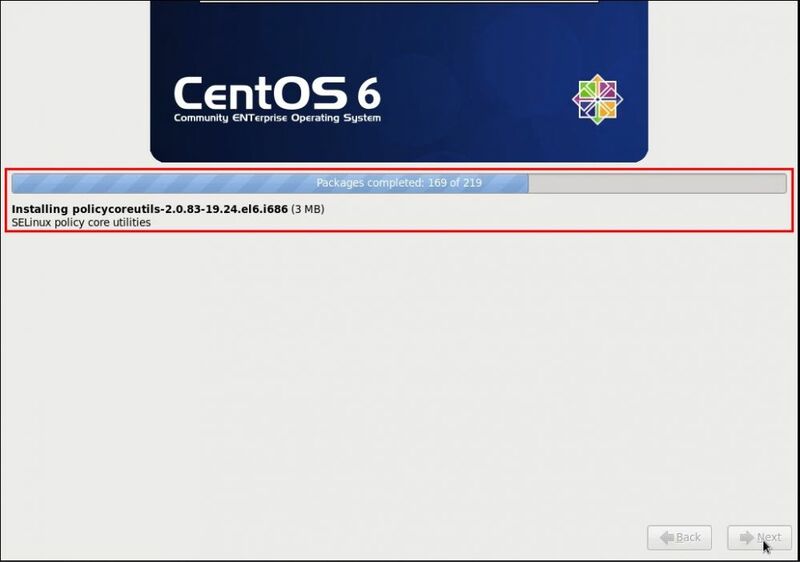 1) Turn on the a different client from the client that was used for installing the CentOS, the client will boot (Figure 39). 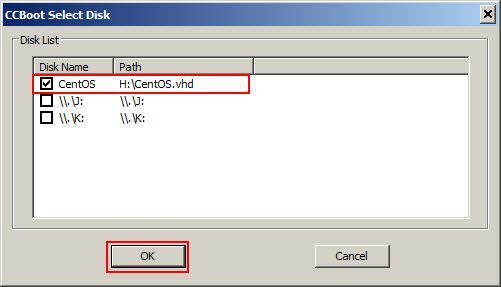 2) Once it starts to read the Linux OS data, will see the boot screen for Linux Cent OS (Figure 40). 3) Let it continue and get to the desktop (Figure 41). 4) Once, booted, login to Linux OS using the user name (user name is root) and password, you set during installation (Figure 42). 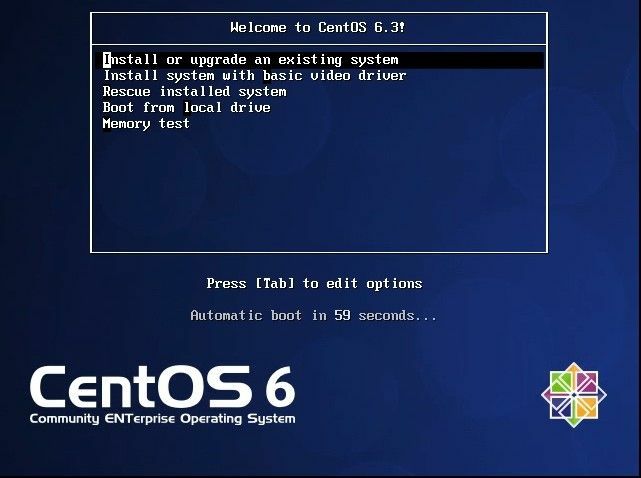 5) Now, Cent OS is fully loaded and logged in from CCBoot (Figure 43). 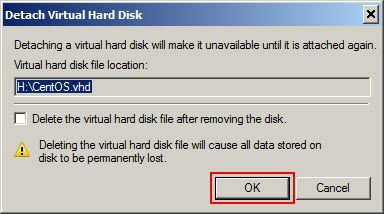 Note: Currently this method is only applicable to Cent OS as other client PC do not have native iSCSI support.